Vynnychenko, Volodymyr [Vynnyčenko], b 27 July 1880 in the village Velykyi Kut, Yelysavethrad county, Kherson gubernia, d 6 March 1951 in Mougins, France. (Photo: Volodymyr Vynnychenko.) Writer, statesman, and politician. Vynnychenko began to study law at Kyiv University in 1901 but, owing to his expulsion in 1902 for ‘revolutionary’ activities, he never completed his studies. He was a member of the Revolutionary Ukrainian party (RUP) and, later, the executive committee of the Ukrainian Social Democratic Workers' party (USDRP) and editor of its journal Borot’ba. 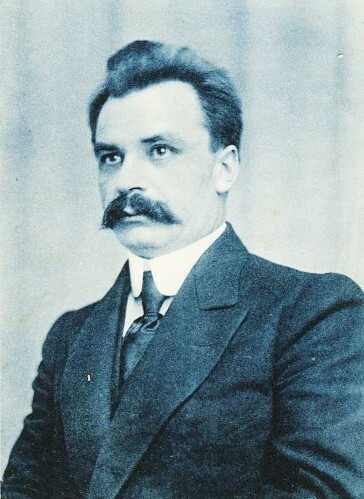 To avoid arrest for his political activities Vynnychenko fled abroad many times between 1903 and 1917 and returned clandestinely to Ukraine or Russia. An unsuccessful clandestine return earned him a year in prison (1903–4). 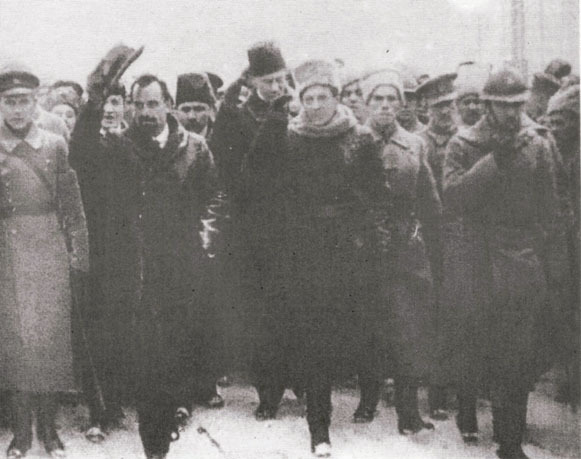 During the First World War Vynnychenko lived in Moscow illegally, and in 1917 he returned to Ukraine to take part in the struggle for independence (1917–20). 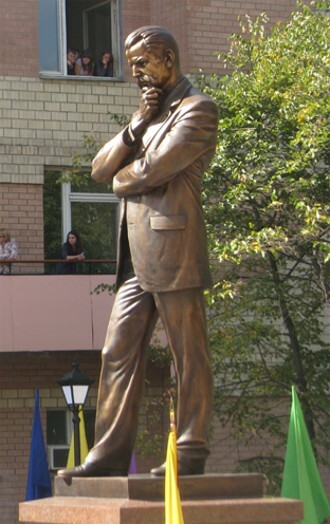 As leader of the USDRP he was chosen one of two vice-presidents of the Central Rada and then the first president of the General Secretariat of the Central Rada, the autonomous government of Ukraine. During the Hetman government he headed the oppositional Ukrainian National Union, and then, from its creation in 1918 until February 1919, the Directory of the Ukrainian National Republic. 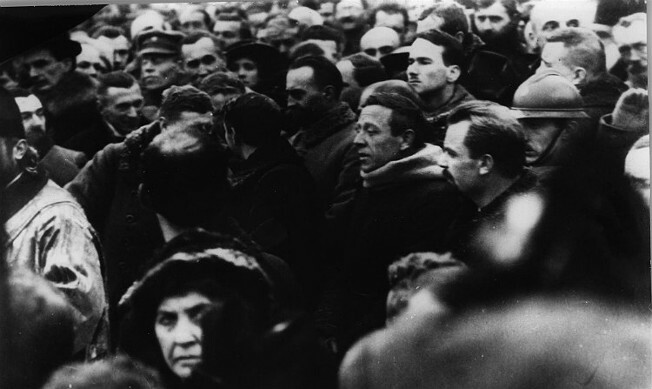 Upon disagreeing with the rightist and pro-Entente politics of the Directory Vynnychenko left for Vienna, where he tried to mobilize Ukrainian socialists abroad and to negotiate with Vladimir Lenin an independent socialist Ukrainian state. His attempts in 1920 to reach a similar end while in Ukraine also proved unsuccessful, and Vynnychenko emigrated and finally settled in France. Though he maintained contact with some Soviet Ukrainian leaders he never returned to Ukraine. He devoted himself almost exclusively to his literary career. Vynnychenko began writing while he was a student, during which time he produced stories depicting the working-class milieu, which he knew best. His first story, ‘Krasa i syla’ (Beauty and Strength, 1902), created a sensation and brought him almost immediate recognition. In both his heroes (the working class protagonists, the déclassé, petty criminals, and, finally, revolutionaries) and his themes he abandoned the former populist didactic piety for the more risqué contemporary revolutionary life, which is often tinged with explicit sexual tensions and wry humor, and is presented in a dynamic, impressionistic narrative style and a language bold enough to use the most current patois (surzhyk). His short stories were extremely popular as a result. More a poser of problems than a stylist, Vynnychenko did not polish his work; often it seems hurried and even tendentious. 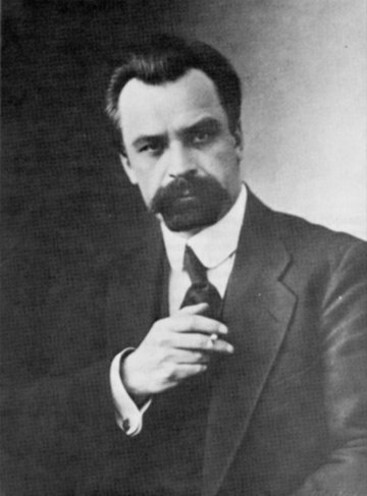 The desire to postulate solutions to various social and moral problems led Vynnychenko to drama, where he could more readily examine, as if in a moral laboratory, the consistency of human behavior with the accepted morality, especially the morality of the ‘new revolutionary man.’ In the 20 plays he wrote (many of them translated and staged in various theaters of Europe) Vynnychenko examined closely the frequent disparity between deed and ‘noble word,’ aim and moral code. The proclaimed equality of the sexes is debunked in Bazar (Bazaar, 1910), the notion of spiritual love, in Dysharmoniia (Disharmony, 1906), the acceptability of ‘surrogate motherhood,’ in Zakon (The Law, 1923), and the belief that ‘a noble end justifies the means,’ in Hrikh (The Sin, 1920). Other no less interesting plays are Velykyi Molokh (The Grand Moloch, 1907), Brekhnia (The Lie, 1910), and Chorna pantera i bilyi vedmid’ (The Black Panther and the White Bear, 1911). Having found that moral codes were often set to protect the interests of a dominant group, Vynnychenko sought to find a way in which humans could live a truly moral life, and came to the notion ‘To thine own self be true’ as the only viable moral law. Promulgated best in his novel Chesnist’ z soboiu (Honesty with Oneself, 1906), the notion provoked misunderstanding and criticism. Vynnychenko was accused of strict individualism and total amorality. In all, 11 novels appeared during Vynnychenko's lifetime, of which Zapysky kyrpatoho Mefistofelia (Notes of Pug-nosed Mephistopheles, 1917) and Soniashna mashyna (The Sun Machine, 1928; the first Utopian novel in Ukrainian literature) stand out. Of the three novels which appeared posthumously, Slovo za Toboiu, Staline (It's Your Word Now, Stalin, 1971) is interesting as an example of Vynnychenko's political thinking after he developed his own moral world order, which he called ‘concordism.’ He propagated that concept in the novel Nova zapovid’ (The New Commandment, 1949). Throughout his life Vynnychenko kept a detailed diary, of which two volumes have been published (Shchodennyk [Diary, vol 1, 1980; vol 2, 1983]). They provide some insight into his artistic, personal, and political life. Of historical interest is Vynnychenko's three-volume memoir of the struggle for independence (1917–20), Vidrodzhennia natsiï (Rebirth of a Nation, 1920). Until the late 1980s Vynnychenko was proscribed in Ukraine, and his collected works have not been republished since the 24-volume edition of 1926–30. In the West interest in him was maintained primarily as a result of the efforts of Hryhory Kostiuk, under whose guidance the standing Commission for the Study and Publication of the Heritage of Volodymyr Vynnychenko was established at the Ukrainian Academy of Arts and Sciences in the US. The commission is the custodian of the Vynnychenko archives, housed at Columbia University in New York.